People drawn to the smell of a chip shop are being attracted by complex aromas including butterscotch, onion and ironing boards, scientists believe. Food scientists at the University of Leeds unravelled the smell of the chip shop in the laboratory as well as using human noses to separate the aromas. 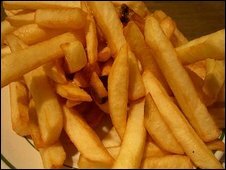 Dr Graham Clayton, who led the research, said that however they were cooked, chips had a complex aroma. He said chip scents could be treated like wine aromas in the future. The team of scientists broke down the smell into components using a process known as gas chromatography mass spectrometry. An analyst sniffed the smells that could be detected by the human nose and recorded their type and strength. The research, which was commissioned by the Potato Council for National Chip Week, showed chip aroma is made up of butterscotch, cocoa, onion, flowers, cheese and ironing boards. Dr Clayton said: "Whether oven-cooked or fried, the humble chip doesn't smell of just chips - the aroma is much more complex and probably explains why chips are everyone's favourite. "One might not expect to find butterscotch or cocoa aromas in chips, but it has to be remembered that these are one part of the overall aroma. "Perhaps these findings will see chips treated like wine in the future - with chip fans turning into buffs as they impress their friends with eloquent descriptions of their favourite fries." The kind of potatoes, oil, cooking method and temperature all affected the aroma, the scientists concluded.